Song "Minnie the Moocher," film Hi-De-Ho. "My audience was my life. What I did and how I did it, was all for my audience." Cab Calloway grows up in Baltimore, a predominantly black city. During this time Cab works as a paper boy, walks horses at the racetrack, and sings all while going to school. Calloway attracts notice for both his athleticism in basketball and artistic skills. He follows in the footsteps of his older sister, Blanche, who is already a recognized performer. Cab receives a few lucky breaks filling in for important shows and helping hands from established peers, such as Louis Armstrong. 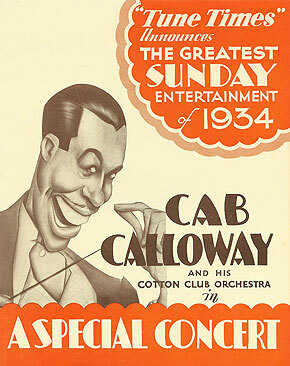 Cab performs his first tour with Plantation Days (1927) in the black theatre circuit with the attendant difficulties. Calloway manages to make an impression at the Savoy Ballroom despite his orchestra’s failure (his band is kicked out, while he is hired to lead the band that beat them!). He attracts notice from Irving Mills and Duke Ellington’s musicians. Cab Calloway has a residency at the Cotton Club under a white manager and plays for predominantly white audiences. Cab plays the Lucky Strike show. This is the first white radio show to welcome a black big band. Cab Calloway appears in 3 Betty Boop cartoons and from then on is repeatedly caricatured in cartoons of the time. 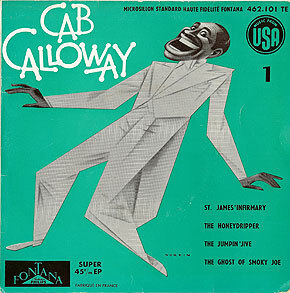 Cab Calloway tours through the Jim Crow south becoming the first renowned black big band to tour the segregated southern states. Cab Calloway tours and experiences racial troubles. Rioting during concerts, caused by segregated audiences. Cab is obliged to hire a private train. Cab takes a European tour (England, Holland, Belgium, France), and experiences the differences between the ways Blacks are treated in America versus in Europe. Cab attempts to move into a white neighborhood and is rejected by the neighbors, who put racist signs up in his front yard. Cab writes an article about how white jazz musicians are robbing black orchestras. Cab Calloway’s dictionary of jazz musicians’ slang, Hepcat Jive Dictionary, is put on the shelves of the New York Public Library. Cab’s recording 78 rpm, “Jumpin’ Jive,” sells 1 million copies. Calloway gets involved in the struggle for black jazz musicians’ right to take the bus rather than be obliged to travel by car. Cab’s radio quiz show Quizzicale is suspended for lack of sponsors. Cab appears in Stormy Weather, one of the first films with an all-star black cast. Racial problems occur during filming, such as eating and housing arrangements for the cast and black press reactions. The film is censored by a Memphis D.A. Cab Calloway's 78 rpm "Jumpin' Jive"
Cab Calloway gets in an altercation at a Lionel Hampton concert. He is beaten by a white cop but is charged with assault. Cab marries Nuffie, a militant black feminist. Cab throws a benefit concert for Isaac Woodard, a black soldier blinded by a racist policeman. The FBI starts a file on Cab’s activities. Cab appears in Porgy and Bess for the US and European tour. Cab is refused a seat at a bar in Las Vegas, where they’d gone for a drink with Louis Prima after a concert. Prima is so outraged by the incident that it affects the course of his career. Cab moves to White Plains, an upper-middle-class suburb of New York. Cat participates in the Nat King Cole Show on TV, which is in danger for ending for the same reasons as the Quizzicale. Cab appears in Hello Dolly. Cab Calloway appears on Sesame Street. Blues Brothers creates a tribute to black culture, and a resurgence in popular interest in Cab Calloway. Cab performs a world tour and multiple revivals. Cab is invited to the White House where he is decorated by Bill Clinton.